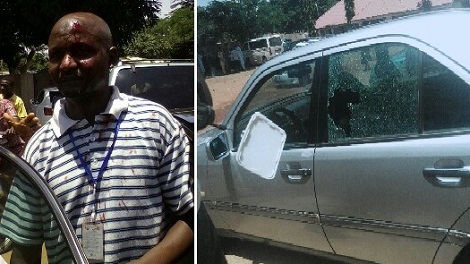 According to witnesses, heavily armed Political thugs said to be sponsored though, stormed the Headquarters of Nigeria Union of Journalists (NUJ) kaduna State Council with dangerous weapons and disrupted an ongoing press conference being addressed by aggrieved members of the All Progressive Congress (APC). It was said that the party members had come to register their grievances over the alleged selection of delegates which according to them defiled the laid down constitutional provisions for such exercise, but alas that wouldn't be, as the press conference they called was disrupted and journalists who were carrying out their duties mobbed, stabbed and injured. 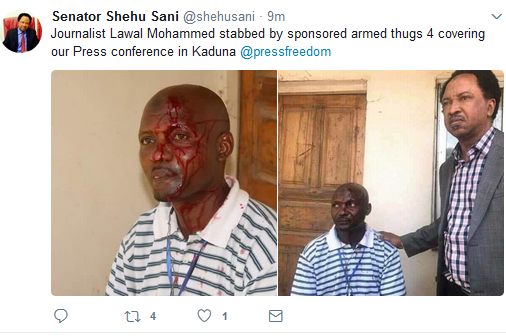 Senator Shehu Sani who has also spoken about this took to Facebook to say the attack was an attempt to kill them in order to silence them.